Our knowledge of baby dinosaurs is pretty much nil, even for species we're really familiar with. Baby dinos tend to get eaten or just taken apart by the millions of years weighing down on them. And that means we have a very incomplete understanding of a dinosaur's life! How did they change over time? What did they eat as youngsters? Did they tag along with parents or older dinosaurs? Who knows? We might as well just watch "The Land Before Time" movies. But in Alberta, in a hotspot of dinosaur discoveries, this baby ceratopsid was found this week. It's sort of rhinoceros-shaped, and in the triceratops family of crested dinosaurs. This particular one was about three years old when it stumbled into a river about 70 million years ago, but it remained so thoroughly untouched that its skin even left imprints in the rock. It's the smallest skeleton of its type to ever be found. The skeleton tells us a lot about this dinosaur. In other species, like the Tyrannosaur, the juveniles had disproportionately long legs, presumably to run along with the adults in its pack. 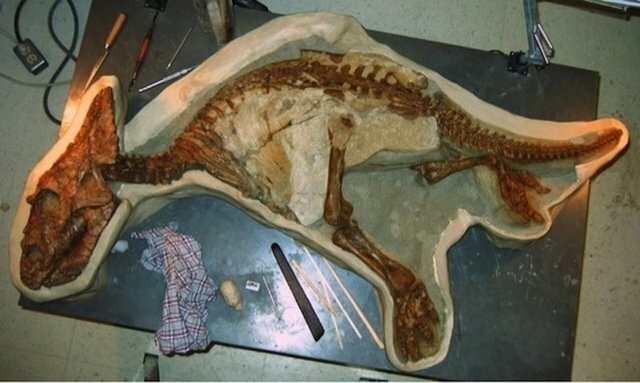 This ceratopsid, though, has the same limb proportions as an adult of its species, indicating that the plant-eating species was not particularly mobile. It's easy to feel a disconnect with dinosaurs, and not just because their time is so long gone. The old depictions in books and movies of the ferocious, stupid lizards is starting to be replaced with a more complete view of how these animals really lived--and finding a baby skeleton like this just adds to our understanding. Read more about it here.